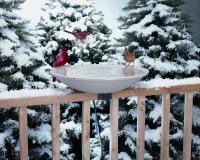 Living in Minnesota, where a bird may freeze solid if its body gets wet in winter, I was worried about providing a heated bird "bath". But providing birds with drinking water, when all ponds and streams are ice-bound, is desirable. So I took the chance and installed an Allied Precision heated bird "bath". And the birds and I are delighted. They are sensible. They flock to the rim to drink, but not to paddle. Perfect! The product is well engineered and durable. Its thermostat maintains the water at a steady 54 degrees ... so steam rises from it on colder days. The steady evaporation means that I must top it up daily. But that simple chore encourages me to empty and refill it when the water is dirtied by seed particles, etc. I suggest that Backyard Chirper should recommend using a Water Wiggler type of stirrer as an accessory to this bird bath: birds mistrust completely still water. 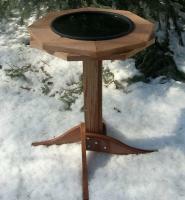 The birdbath stand was easy to assemble. The Indiana Winter birds are enjoying the perfect drinking water. 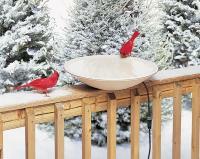 The robins and cardinals have been taking regular dips. The bird bath blends in well with the winter background. Our dog groomer was so impressed with it that he plans to purchase one, too. It's a beautiful bird bath! 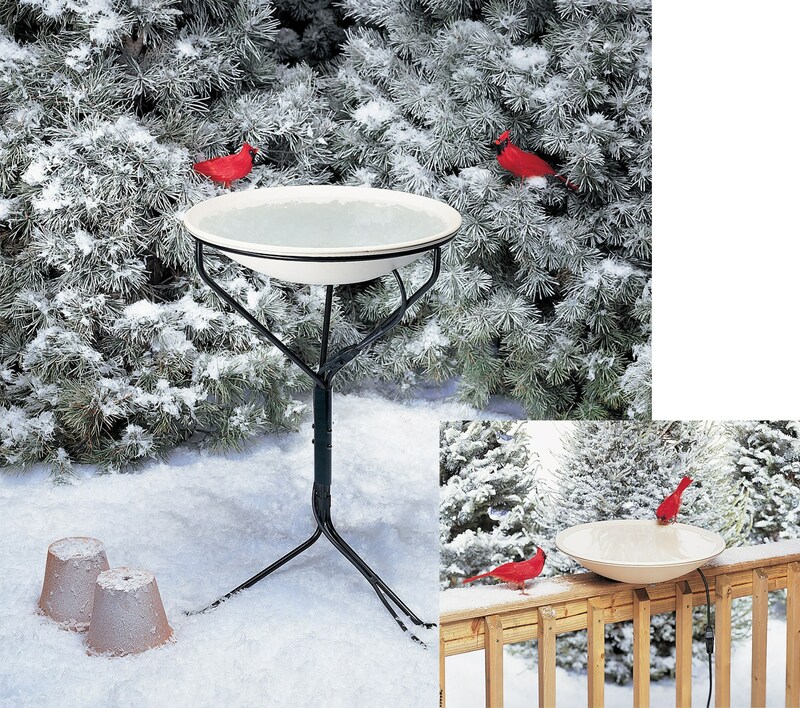 I love this heated birdbath. I would highly recommend getting it. It's a nice shape and the birds love it. We have the most popular yard in the neighborhood for our feathered friends. 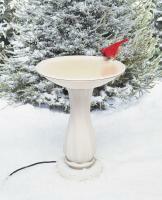 The bird bath passed the test here staying unfrozen when the temp dropped to the low single digits. The birds absolutely love to just hang on the side. It was the perfect gift for my bird loving girlfriend! My purchase shipped to me very fast. I love that my birds have fresh water when water is frozen everywhere else. This has been a very, very cold winter. My birds love it too! The style is the nicest and most elegant one I have seen anywhere on the internet. I searched high and low and looked on at least 5 or more other birding and gardening websites.